“My dog is dominant …” is a rather common expression nowadays to describe a dog’s character. It is used for animals who pull on the leash, jump on to the couch / bed, cross the door before their owners, or show unwanted behaviors towards other dogs or people in certain contexts. Is This Expression Used Correctly? Dominance is defined as the percentage of successes of a dog when competing for resources with another individual — “resource” meaning food, toys, water, caresses … Therefore, dominance – submission is something that happens between 2 animals, not the character trait of an individual. Also, the dominant animal in the dispute for a resource does not necessarily win every single time. The term dominance has been used for a long time, incorrectly, due to the theory of the alpha male / female — the leader of the pack. This theory defends that some animals who are born with a dominant temperament, and their aim is to take on the highest rank in the pack’s hierarchy — be it composed of other dogs, humans or both —. To do that, they would frequently resort to aggression. This theory is based on the ancestor of dogs, the wolf. Why Is This Theory Invalid? For starters, it does not take into account that dogs have gone through a long process of domestication and selection. Along this process, they evolved into the current breeds of dogs, our furry partners, physically and psychologically different from their common ancestor, the wolf. For example, neoteny: the persistence of infantile behavioral traits in adult animals. 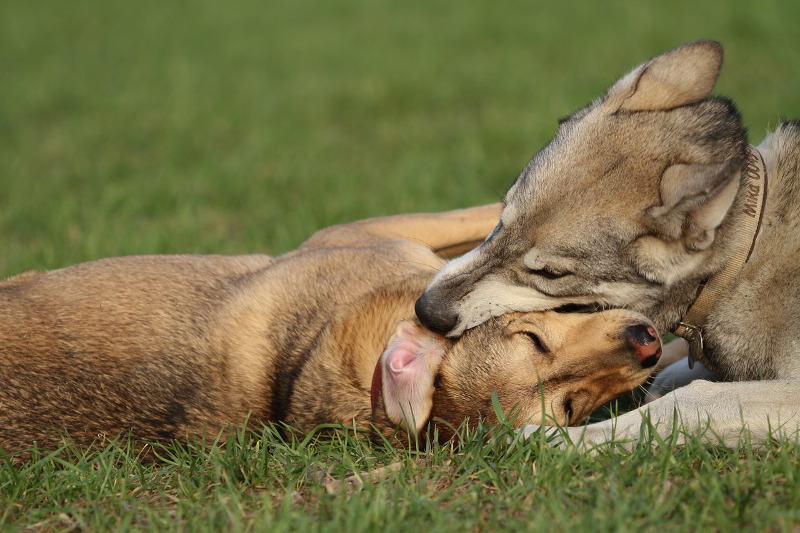 The behavior of an adult dog is more similar to that of a young wolf than an adult’s. On the other hand, this theory is based on studies that at present have been refuted. They studied hierarchy in packs where the animals were not related necessarily and, moreover, were in captivity. Both factors notched up the levels of aggression among the wolves. Bear in mind that packs of wild wolves are formed by a reproductive couple (sometimes more), and its descent. In these family nuclei fights are not frequent and, when they happen, they seldom cause serious injuries. The theory of dominance also defends that training methods based on punishment or forced submission makes dogs more docile and, therefore, less aggressive. One of the techniques they use, for example, is the “alpha roll”: forcing the dog to lie on its back when it shows an unwanted behavior. Nowadays all these methods are considered counter-productive, besides putting the owner and the animal itself at risk. Therefore, if your dog: pulls on the leash, jumps on to the bed / couch, does not release toys when asked, crosses the door before you, or is reactive towards other dogs or people in certain contexts … it does not mean that it wants to dominate you or be the leader of the pack.